We finally got a mess of cucumbers, all-be-it they are rather dinky ones, but they are cucumbers none-the-less. Until recently, the deer kept the vines eaten back. We’ve kept an eye on the vines and as soon as these little ones plumped out, we picked them. Fresh cucumbers are a tasty side dish, in salads, a snack or even a sandwich. The evil demon squash vine borers murdered my acorn squash vines and forced me to harvest them. According to the information I’ve read, these acorn squash are ripe. I’m amazed since they should have had another month to go. However, I’m letting them set on the coounter awhile before I attempt to cook one. These are winter squash, so letting them set shouldn’t harm them. I’m happy that I finally got a small harvest of romaine lettuce. I have different ages of the lettuce growing. I had to replant them because of two lovely doves eating the seeds. That worked out well because I don’t have to worry about harvesting and storing the lettuce. So I guess I owe the doves a thank you. 🙂 I harvested my first squash. I’m looking forward to cooking them up in a stir fry with this fresh mess of green onions. We haven’t had enough rain to make our garden flourish. If the rain would come for more than a passing shower, we’d be covered in squash. produce a bounty of goodness for you. I’ve decided to keep my gardening news down to a minimal. I realize that my gardening post can get monotonous year-after-year. I plan to hit the highlights or whenever I’m particularly feeling the gardening-posting spirit. Here is the USA, for a good part of this year, there’s been a health warning out about Romaine lettuce. I understand that label reading to make sure of the vegetables origin hopefully helps make a safer choice. 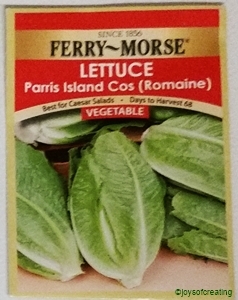 However, We’ve decided not to chance our mis-reading a label and have decided to grow our own lettuce. I planted the lettuce seeds in my herb bed since it’s full of bought garden soil that grows stuff alot better. I lightly broadcasted the seeds in the back half of my herb bed. I planned to thin them as they grow. There’s been a sprinkle rain or two since I planted them. My husband has watered the area a time or two. I’ve been waiting for the first show of little greens. I looked out the window and saw a couple doves bathing in the birdbaths in my herb bed. I grabbed my camera and got a few photos of one of the doves. Not perfect, but nice enough. And together they had a field day in my lettuce patch… Ah yes… such is the circle-of-life… where even well meaning healthy choices help to make for a food source for the fauna. Our vegetable garden has become a buffet for the deer. It’s not been but a couple weeks since we planted the garden. The chard is gone and most of the tomato plants. We’re planning on replanting soon. We try-not too don’t get upset with the fauna that takes advantage of our gardening. We’ll probably put up some deterents, but that’s about it. I don’t see that this year’s gardening is going to be very successful and then again it might. It’s still early in the season. Thankfully, we really enjoy seeing the wildlife. watching the wildlife that enjoys your gardening too. We cleaned up the herb bed Sunday. We cut back the Stevia and pulled up and bagged the dead herbs and flowers. It looks better, but still sad after the lush year it had. I discovered that my accidental rose cutting is trying to bud. I’m so surprised. I doubt the weather stays warm long enough for it to bloom, but I’ll keep an eye on it and see how far along it gets. My husband came in from working outside and told me to come and look at something. He said it was something I needed to see. I followed him to the shed with my camera in hand. I was so tickled to see a black swallowtail butterfly chrysalis in the space. It’s overwintering there. How cool is that? It’s been storming all night here and it’s still going on. It’s the whole show complete with lightning and sound effects along with curtains of wind and rain. Shelibean is not happy at all. He’s snuggled down under a blanket beside me feeling quite protected from the weather-at-large. Here’s wishing you all gentle weather this Tuesday.